Omar El Akkad, author of “American War,” will be at the Student Union Hunt Room on Thursday, March 28, from 3:30 to 5pm. El Akkad will be reading from his work and doing a book signing. “American War” is the 2019 selection for the Writers & Books Rochester Reads community-wide reading program. El Akkad’s “American War” envisions a second American Civil War at the end of the 21st century. Within the story, told through the eyes of one family, climate change has resulted in political upheaval and devastating violence, and the country’s population is further diminished by a plague. Check out Fall Foliage in Livingston County, New York! Letchworth State Park , also known as the Grand Canyon of the East, is an incredible landmark and natural wonder. We have a Foliage Map to help you enjoy the gorgeous autumn foliage. Also, we offer tools to explore activities in and around the Livingston County, NY area. 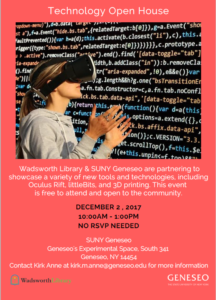 Technology Open House at SUNY Geneseo: Saturday December 2nd 10am! Oculus Rift, 3D printing, and more! When: Saturday, December 2, 2017 from 10:00am – 1:00pm. 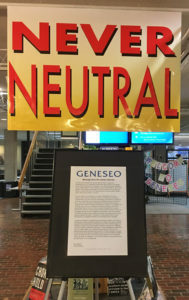 Where: SUNY Geneseo’s Experimental Space, South 341.